The lionfish are biological pollutants, they are considered predators and close to the top of the food chain, this makes them dangerous to the ecosystem and humans as they can inflict extremely painful stings. They are currently out-competing native predatory fish such as grupers as well as reducing herbivorous fish population through consumption, with no herbivorous fish controlling the algae and plant growth it will start to seriously affect coral growth and eventually destroy the corals in the reef. The lionfish are native to Indo-pacific so anywhere from the red sea through to the Indian Ocean to Hawaii. There are two species, pterios volitans which on the map below are highlighted in green and p.miles which are highlighted in blue. 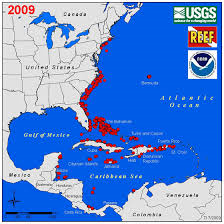 It is these species that are responsible for recent threat to the Atlantic reef as well as the Caribbean reefs. Nobody can say for sure when the invasion started however there is some evidence that suggests it’s around 1985 off the Florida coast and by 2001 the sightings increased and were seen to be off the coasts of Georgia and Bermuda, and throughout the last decade they are heading as far south as the Gulf of Mexico and South America. Marine scientists have predicted that the invasion will have reached Brazil in the next 10 years. The Lionfish inhabit areas of the coast. Lionfish have a voracious appetite and are non-selective in their feeding, easily preying on fish and crustaceans up to two thirds of their own body length. They can do this due to the fact their stomach can expand up to 30 times its normal size after a meal. They have very few natural predators and have a very high reproductive rate with one female being able to produce 2 million eggs per year. The fact is that they can quite easily reduce the numbers of commercial fish species such as snapper and gruper as they feed on these whilst still being juveniles. This will then have a huge effect on not only the environmental implications but the economic implications as this will impact on the number of fish being caught, commercial stocks will decrease this will then lead to restrictions being brought in on the amounts of fish being caught and the size at which they can be caught. As well as being a health and safety issue for humans i.e. swimmers, snorkelers, and fishermen (as they would be at risk from a lionfish’s painful and venomous sting) it would also leave native reef fish populations and the coral reef community stability at great risk from their interactions with this species. Whilst researching this area I found some information on the NOAA’s Undersea research programme by a Scientist called Mark Hixon (2009) he conducted an experiment over 5 weeks in the Bahamas and established that lionfish can cause significant reductions (by 79%) in the population of native fishes. One large lionfish was observed consuming 20 small fishes in a 30-minute period. Jessica Wurzbacher (2011) wrote an article for sailors of the sea from a study done by Dr Gupta (2009) examined samples from Lionfish stomachs in the western Atlantic that showed that they consume more than 50 different species of fish a lot of these are already over fished and already down to critical levels, due to this extreme rate of lionfish feeding native predators are already being out competed by the lionfish for their food source. The United states estimate that it would cost them around $138 billion per year in lost profits on all invasive species. However this is a rough guess as they don’t know this for definite. On the Lionfish itself there isn’t an exact amount to pinpoint the economical implications, but it is thought that if the lionfish invasion continues and they eat all the small fish they can it will directly impact the fishing industry as the fishing catches will become smaller therefore the amount of fish being sold to other industries will dramatically reduce, it will also impact on tourism as less people will visit reefs e.g. for diving and snorkelling as it will be less likely that they would see the fish that they would want to see. Because of the nature of these lionfish and the implications they have on the reefs they need to be caught to reduce the damage they could do. One way to do this would be a cull this would involve either non projectile spears or nets. So a group of divers would go down and try and get as many lionfish and kill them this would occur every 3 months or 6 months depending on the reef. 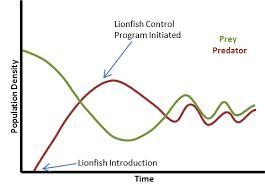 The problem with this particular method is that the lionfish are exceptionally clever and they learn to react to the human presence, on parts of the reef that are not culled the fish’s behaviour was measured against the behaviour of fish in culled areas it was noted that the fish in culled areas changed their behaviour pattern, they became less active during the day often staying concealed which is when the cull would normally occur, they also reacted sooner to the presence of divers, these differences may result in the lionfish being less likely to be encountered and more difficult to capture in the future, it has been suggested that a lionfish that survived a cull would subsequently be more difficult to remove in the future. There are many other factors that affect the coral reef ecosystem on the south east coast, therefore it’s difficult to calculate how much of this damage is solely to blame the lionfish. Because of this uncertainty it would become an ethical issue as the culls involved to kill the lionfish could be doing so unnecessarily, as regardless of how many you take out you will never take them all and would possible harm other species. The lionfish are considered an invasion that is said to have been caused initially by the human hand i.e. they have either been released by fish keepers due to the fish being too big for their aquariums or an accidental release from an aquarium during a hurricane in Florida during the late 80’s, a blind eye or even incentives are given to kill the lionfish. Whether this is right or wrong it seems like its end justifies the means. So it’s hard to say whether taking an animal’s life is warranted on occasions. The lionfish invasion has had a substantial effect on various coral reefs across the United States and much of the Caribbean Sea. The invasion of these species is detrimental to the reefs as they can wipe out many other species of fish currently habituating there some of these fish are actually on the endangered species list. The cost to control the invasion and even trying to control it costs the U.S around 138 billion on various different invasions. It has become apparent from various experts that if the lionfish aren’t captured and dealt with then they will just keep growing and any sort of intervention to reduce the invasion will fail to fix the problem. It is likely that lionfish both directly and indirectly cause damage to the ecosystem of the reef, they are aggressive predators with no natural predators of their own in this new environment. Their appetites can alarmingly reduce the stocks of native local fish and some mobile invertebrate numbers to the point where native predatory fish cannot compete to feed on these prey animals, this can then have a knock on effect on the survival of these native predators. Analysis of the stomach contents of lionfish have revealed a huge diversity in the size and species the lionfish is able to prey on. One comment by the participants of this analysis was that the lionfish will eat anything that will fit in its mouth. As the Caribbean is colonised more by the lionfish the effect on the coral reef could be devastating that are already suffering due to pollution, climate change, overfishing, disease, sedimentation and other stressors. Although it is too early to be definitive, the evidence from the Bahamas does seem to support this information. To make sure the information in my report was valid and reliable I made sure I backed up my information with links to references on chosen websites. This links the information I have written with trusted websites to show that the information is both valid and reliable. Some of these links also had comments and studies by scientists and researchers creating a wide range of information sources. Due to these reports being researched and written up by scientists and proper studies have been recorded with statistics including numbers of lionfish, how much they consume and the efforts to remove them, their knowledge would be more accurate than information found in a blog or website with information written by a member of the general public. For example the NOAA who specialize in environmental issues and are willing to show information and images of lionfish they have removed therefore I believe their information to be reliable and valid as they themselves are attempting to impact on the invasion. The NOAA and other websites have produced graphs and charts to show the scale of the invasion which I have also included. Image 1 is A representation of the predator and prey population relationships between invasive lionfish and the native Atlantic Ocean fish that lionfish prey. Statistics from the United States geographical survey (usgs) provides quite a lot of information which is both geographical and historical and shows how the lionfish have been distributed over time and where they have moved to. After looking at various different sites and reading data and statistics it seems that the removal of the lionfish is divided by ethical and environmental implications. When it comes to conservation whether it be giraffes, rhinos or any other animal that is killed for various reasons it is always going to cause controversy, an article from Biodiversity professionals that was written by Roger Harris about Howard (2014) who spoke about the taking of any life being the antithesis of conservation. He spoke about a rhino that was auctioned off for a planned hunt, a furore erupted even though the auction raised $350,000 for conservation. There doesn’t seem to be the same outlook when it comes to the lionfish, there is certainly no outrage or complaint about the hunting competitions organised for the lionfish, an article written by Hannah Hoag in nature.com writes about the fishing competitions that she says are helping to keep this problem in check, however this cannot necessarily be proven one way or another. From this lack of response it would appear it is not ethically questionable to kill invasive species, especially to control a problem that humans had a hand in introducing in the first place, as we know genetic testing has traced the origin of the invasion to a dozen or so fish found off the coast of Florida. So is killing these animals morally reprehensible? Some may argue that is it better to take the moral high ground for the purpose of attempting to right a wrong. Either way you can’t say that there isn’t a problem with these lionfish and their invasion it’s just a question of whether to get rid of them or not as well as the question of the most humane way of doing this. It seems that whatever the conclusion there will always be two sides to the argument of whether the Lionfish pose a threat or even a problem. Elaine Blum (2009) The Indo Pacific lionfish invasion of the Caribbean Sea. Available at: www.icriforum.org. (Accessed 20 Nov 2014).